Just before I went for a vacation I decided to pick up some items from the Makeup Forever and I had been a fan of Make up forever Mat Velvet plus for a very long time and was itching on trying their HD foundation though I had it before and it was on my wrong shade so I didn't use it anymore and it was just on my train case for clients. So I finally went to visit a Make up forever counter since there is a new store opened a few blocks away from my work I decided to give it a peek and maybe I can get something nice. And Ended up buying 3 items from them. First thing I want to buy some more but the lady who's assisting me was nice but she's giving me wrong information about the products. She's even giving me the wrong shade of foundation and concealer and kept on insisting that shade. 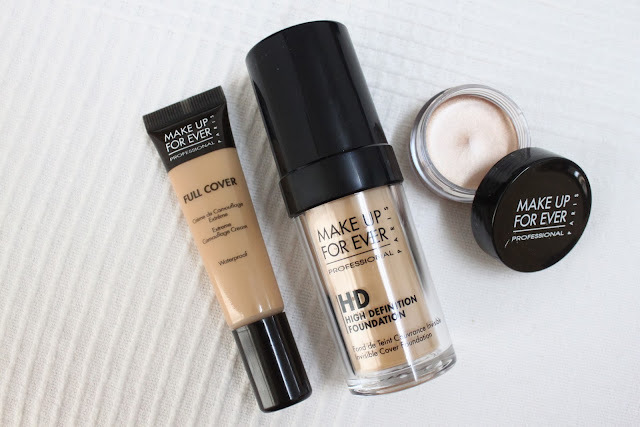 The last time I bought the HD foundation I listen to the lady on the counter and ended up wasting my money because they're not very lenient with return and exchange policy here and I don't want to do the same thing again so I just get 3 foundation shades close (i think) to my skin and swatch it on my jaw line which is the easiest for me to match if I'm buying a new foundation and she just said that "ahhh that's perfect for you" and ended up buying the shade #123 which is a yellow base foundation for light-medium skintone. Then I pick up a concealer and again she is giving me a #10 which is so so dark for me and I still go to what I know is my match which is #7 from Full cover Concealer. I had been having breakouts recently because of my hormones and wants to cover up the mess they're doing so a full cover concealer is a must for me. The last item I bought was the Aqua Creme #13 Warm Beige which is a very very lovely color. I was actually just seating on the table and was thinking about the concealer when I saw the pot on my table and I grab it and swatch it on my hand and I fell in love with it. It's a very nice base or an easy on the go swept on you lids and viola! your eyes will look fresh and awake. This kind of color is what I use whenever I feel like I want to look more natural and awake. I will be doing a separate review for the concealer and the HD foundation so if you're interested don't forget to follow my blog!